For the best, most up to date experience, use the PC version. In-game chat and mobs are easily switched off. MG has only had good experiences using in-game chat. MG suggests that if switched on, some mobs such as spiders and endermen might be a bit visually scary for younger children but he doesn't think they are too scary. Recommends 1-2 hours maximum at any one time then do something else or rest your eyes especially from some of the biome colours e.g. The jungle biome is very green and might make your eyes feel weird if playing for too long. MG played against a friend in survival mode just this morning. They were mining for diamonds and strategising in their own heads. A bit of harmless fun between two mates. MG would also like to mention that his current craze is Pokemon! 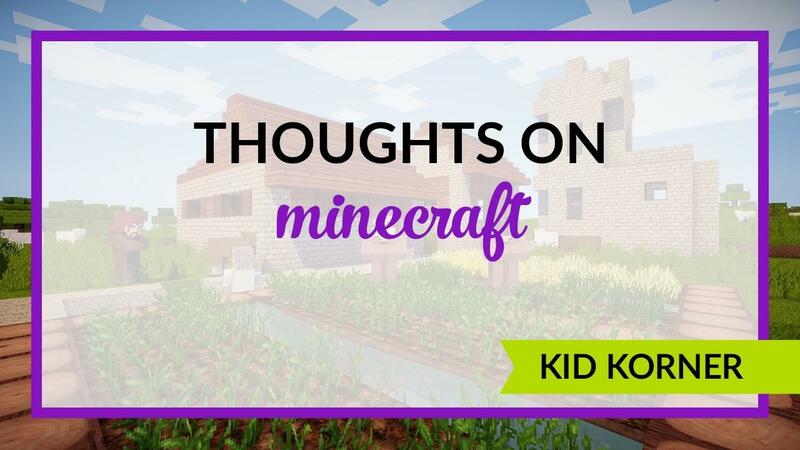 Many thanks for your input MG.
Watch this super advice video from Common Sense Media, called 10 Things Parents Need to Know About Minecraft. Read this informative guide on all things Minecraft. Skim Minemum website with the catchy sub-title: Minecraft Help for Desperate Parents. Please let us know how you're doing with Minecraft. We would love to hear from you. And if you have a question for MG, PLEASE do send it on!